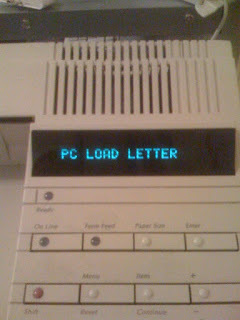 "PC LOAD LETTER?! What the..." See: 'Office Space'. I got an HP LaserJet 4 with a JetDirect card and 8 Megs of RAM (woo!) for $7 (yes , seven) at a garage sale. I've been using inkjets for a long time and lasers off and on, but for this kind of pricing it's a buy. This thing is a tank. Built in Japan in 1993. Original price on these babies was $2199 retail. This is an *OFFICE* heavy cycle machine. 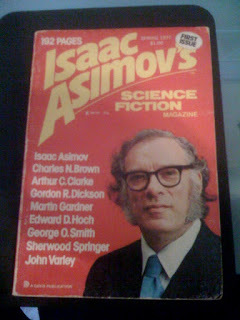 Rated for tens of thousands of pages per month. There are machines with over 1 million page count out there. This one only has 114,000 or so. A baby still. Do you think the Brother for $99 at Office Depot is built as well? OS X is happy with it using Gimp Print and Windows XP is fine with using it as an LPR printer. Vista should work but I got to set that up. It's industrial, fast enough, the price is right and it will probably work for decades. Newer ain't necessarily better, and it sure ain't cheaper. Oh and the movie's excellent by the way. Updated 12/5 with lots of details. 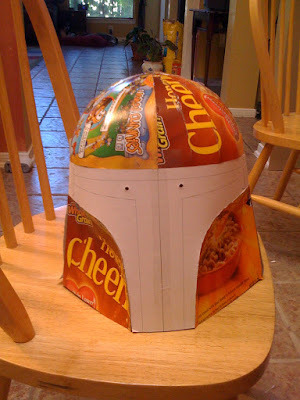 It started life as a Honey Nut Cheerios box. I used a sheet of thicker cardboard from Hobby Lobby for the bottom back opposite the face part. About 1.5 mm thick. A huge plain piece is like $2 there. Back by the picture frame area near the matting. Then for the top I put on Durham's Rock hard putty and sanded and painted that. 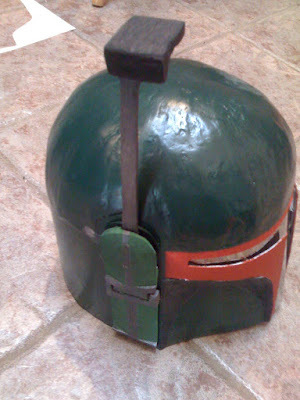 With time, you can make the helmet really smooth but I was pressed for time to make Halloween. Links to the site with tons of patterns are below. For a purist, there are other more accurate patterns there but I think everyone recognizes my version. It's pretty close. 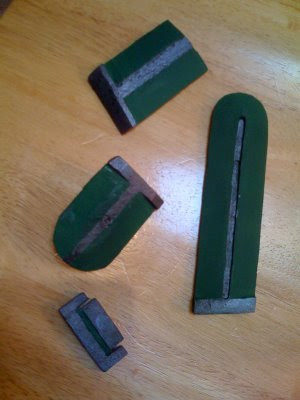 These pieces are just high density foam I glued the pattern to and used an Xacto knife and a dremel with a cutting head for machining the parts I couldn't knife out. Water based acrylic paint. Hot glued on. There is a bolt that goes through the rangefinder bottom you can't see that is hidden by the top fitting. It is tight enough to stop nicely in the up and down position. There is a stop when it's down to hold it level. Inside the rangefinder is a blinking red light from a nametag I got somewhere. Quarter sized PCB with an on off button. The mirror eyepiece is just a piece of window tint. It should be black but I already had the mirrored. The pistol I painted more realistically later with some silver paint to show spall patterns and chipping. 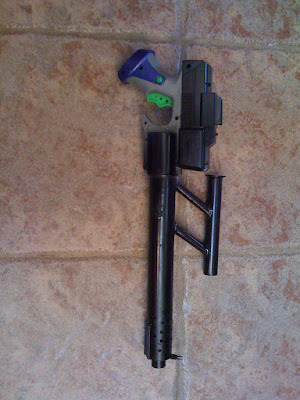 It's a Nerf pistol with the front cut flat to accept the barrel and sight assembly with hot glue attachments. 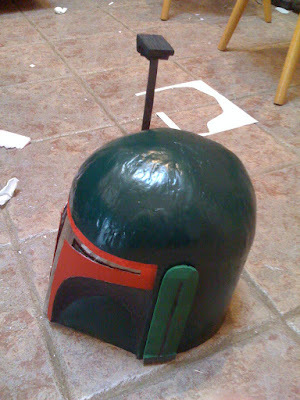 The barrel is a PVC pipe piece with a smaller pipe inside that is centered with a foam ring I made then hot glued. The cooling fins are pairs of Q tips with the heads cut off glued together but if you cut pieces from the rubber of a windshield wiper blade it would look cooler. Drill holes for the cooling shround. The front sight is a small blade fuse glued prongs up. The top sight is a cardboard tube from a clothes hangar (like from the dry cleaner) and a washer. It is held on the barrel by more cardboard tubing and hot glue. I had the wiper blade but ran out of time. The grenade is a foam ball painted black and dark green with another LED pin I got at a party that flashes patterns when you twist it on in about 3 colors. "He's holding a thermal detonator!" 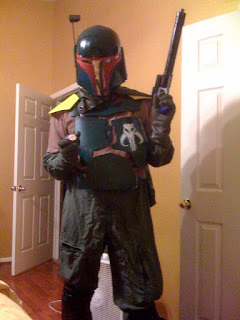 Effective for getting candy or earning higher bounties in distant galaxies. The armor is from the patterns you can find below and made from cutting a Sterilite trash can and melting with a heat gun for shaping. Paint and affix snaps to the the back with epoxy. You can buy a kit to put snaps on at Wal Mart in the fabric section. Rough up the epoxy so it will stick. JB Weld doesn't stick well to smooth plastic. Use a knife to cross hatch where you are going to put the epoxy. Makes sure to add a little battle damage and paint that silver for effect. Like gouges and creasing. Then just snap the armor to the shirt. Kneepads=Roller hockey pads painted black. Flight suit and gloves are my old Air Force issue. The white logo is just a printout cut with an Xacto to make a pattern with spray paint. The cape is an old camo poncho doubled over and snapped once around my neck. school when I showed up at the bike to "collect the bounty on this one" on Halloween day. He should have 'fought' me like McLovin. It's only cool to the OTHER kids. No Audio or Video playback on your Mac? You downloaded that file of remote control bulldozer pit fighters in Croatia that won't play on your Mac? Or like me, you wasted a disc to find that it had no audio because the computer couldn't decode it. I was missing the A52 codec. The page to download it from the author was bjorken. So, if you have the same sort of problem, download Perian from Perian.org. It will install a plethora of codecs for you, including the pesky A52. Using VLC, you can find out what the streams are from one of the menu options after you load the video you are having problems with. (The precise one escapes me for the moment) and it will tell you something like 'DivX', 'A52', and more. If you only want to play the video, then VLC works on just about everything without having to install a codec. I've seen it quite a bit: your laptop or desktop breaks, or you get a new one, or switch to a Mac from a PC or (you'll switch back later) from a Mac to a PC. This will help you if you are doing anything but trying to read a Mac hard drive on a PC. That is possible but beyond the scope of this article. The little device below (and many like it) that Amazon (and many others--I love parentheses!) sell(s) (see?) are designed so that you remove the hard drive from your old and busted and hook it up to the new hotness as an external drive. Remember that static electricity kills electronics. Keep one hand on your PC case or something grounded to dissipate this buildup. Then, you just copy the files you want over to your new gadget. Keep the old drive around for a while. If there's nothing wrong with the hard drive you are copying from, you can also buy an external case and use it for whatever (backups are your friend!). Make sure you get the right interface type. There are two physical sizes and two interface standards (Ok, SCSI, but you don't see much of those.) So, four possibilities: 2.5", 3.5" and SATA (serial) or Parallel IDE. (Sometime called parallel IDE or PATA, etc.) Don't ask me, Google it! • Your choice: TiVo HD or TiVo HD XL DVR. • Savings of $100 on Product Lifetime service—no monthly bills for the life of your new HD DVR. • FREE Wireless Adapter (a $59 value) to connect you to the world's largest selection of Videos on Demand, including movies and music. • FREE Entertainment Pack (over $50 value) so you can enjoy music and movie rentals on us. I've had lifetime pretty much for the last 7 years or so, and while expensive up front, pays off HUGE. I recommend it. Watch your emails TiVo people.